Richard A. Deegan, President of Grand Lady Cruises, Inc. and NYS Tour Boat Association was invited as keynote speaker to discuss the impact of the Ethan Allen tragedy on the passenger vessel industry. Richard A. Deegan, President of Grand Lady Cruises, Inc. and NYS Tour Boat Association was invited as keynote speaker to discuss the impact of the Ethan Allen tragedy on the passenger vessel industry. 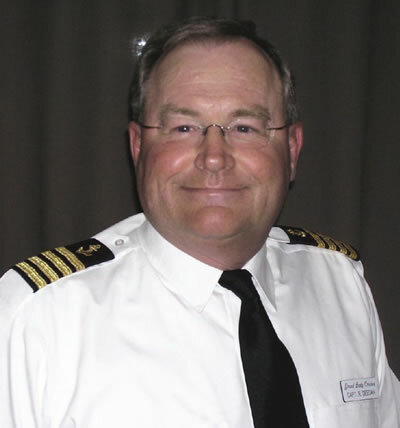 His topic “The Ethan Allen Accident: How It Could Affect You” was presented at the Passenger Vessel Association annual convention Jan 21 to 24 2006 in Seattle WA. On October 2, the Ethan Allen capsized on Lake George, New York, resulting in an unfortunate loss of lives. Even though this was a small state-inspected vessel operating on a nonfederal waterway, numerous questions have been raised that could impact passenger vessel operators far and wide. Twenty elderly Michigan sightseers died in the accident. Twenty-seven other passengers survived, some with injuries. The accident brought the tour boat industry into the public and legislative eye. Now in its fifth year, the PVA Conference at MariTrends 2006 offers an in-depth program for ferry operators and others who are interested in ferry operations. Over 150 attendees from the passenger vessel industry were in attendance for Mr. Deegan’s keynote address. Mr. Deegan has over 30 years experience in the passenger vessel industry. He entered the industry in 1975 as general manager of Miss Buffalo and helped grow their business to include the Niagara Clipper. In 1997 he left Buffalo Charters Inc. to form Deegan Enterprises, a regional tourism services company. He provides consulting to several area attractions and performed due diligence for the formation of Grand Lady Cruises, Inc. In 1998, he founded Grand Lady Cruises, Inc. negotiating the purchase of the Grand Lady and its docking at Holiday Inn Grand Island. Since the formation of Grand Lady Cruises, Inc. Mr. Deegan has grown the business from startup to 200 cruises and 10,000 passengers per year. Mr. Deegan lives in Colden, NY with his wife and three children. Welcome Aboard The M/V Grand Lady. The Niagara Region's newest, most unique place to meet and celebrate, offering an upscale setting for all your corporate and social functions. 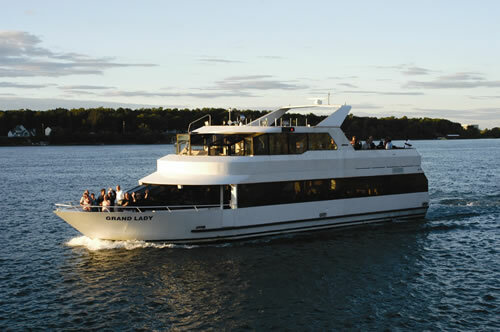 You'll enjoy an experience second to none when you step aboard the luxurious Grand Lady, cruising along the Niagara River for dinner, lunch and other events. The magnificent view, our outstanding amenities, and the total privacy will provide the perfect backdrop to important discussions, private dinners, lively entertainment, wedding, banquet or group tours... or simply some special, unhurried time aboard and away. You'll find that our many offerings such as customized menus, routes and schedules, will help you host an event that will be unlike any other. Treat your corporate guests, employees, family and friends to an exclusive charter on the Grand Lady... and launch your own legendary event. Visit us online at http://www.grandlady.com.